"Friday was my flight to Cebu and the plane was completely full, partly with aid workers from various parts of the world. So some of them were in transit via Hong Kong to the Philippines to join in the rescue work, while the rest was a mix of Filipinos anxiously trying to get home plus a small number of tourists. Just before the flight took off, the Captain made a special broadcast to give thanks to the group of aid workers on board. The otherwise tense mood was lightened by the applause that followed. 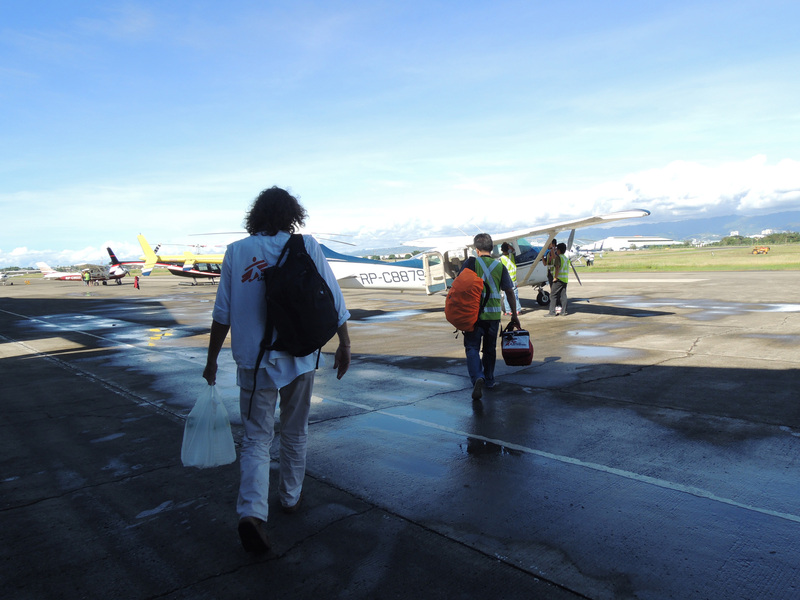 Cebu is the Philippines' second largest city and because its airport is still able to manage incoming flights and is the nearest to the disaster area, MSF chose Cebu as a central point to carry out its relief coordination work. Contrary to what most people might think, any post-disaster relief work actually begins from the back office, where a team of field assessors, communications officers, and logisticians work very hard behind the scenes to ensure that information is exchanged quickly and constantly with the local authorities and government of the disaster area. The aim is to prevent duplication of relief work before the implementation stage, as other humanitarian organisations and NGOs will also rush to help. The logisticians have to work closely with the field assessment teams to plan on the basis of ground information collected and to make rapid arrangements for what seem to be an astronomical numbers of relief packs, included medical supplies, food and of course aid workers. This is also the team which is often the first to go out into the field to collect data and work out the most accessible routes and a transportation plan to carry the teams of aid workers and relief supplies across to the disaster area. Such a feat is definitely not within the ability of medical workers like me – I am just a nurse. In the Haiyan disaster, there are many obstacles for our logisticians and coordination officers. A lot of the roads leading to the heart of the disaster area have been badly damaged and this can slow our teams going to give help. Some of the regions hit by typhoon Haiyan are remote islands. Access has been a tremendous challenge and even if the area has an airport it’s likely to have been damaged. This means that cargo planes carrying relief supplies and aid workers are not able to get in fast enough, while helicopters can only carry a limited weight and volume. Initial media reports have focused mainly on Tacloban where the typhoon hit a substantial town very hard. Now coverage has moved on to more remote areas that have been badly hit by Haiyan. From a helicopter you can see that some of the remote islands were entirely swallowed up by the waters. So we estimate that there will be a large group of victims who will have suffered from bone fractures and cuts. Some of them will have open wounds, which may get infected. Because of the lack of clean water for cooking, we expect to see survivors suffering from diarrhea. Some may even develop illnesses and breathing difficulties caused by the drop in their immune systems challenged by a lack of food. The situation has reached a climax and everyone is worried. The first assessment teams have already been deployed. As for me, there is nothing much I can do except to stay close at the Cebu base and await instructions. It was already midnight when I returned to my room and as I got online to look at the updates, I was bewildered to read some of your messages on my postings calling me a hero. Come on, don’t be silly. I am no one special, just an ordinary nurse from Hong Kong who happens to fit the skills required for this mission in Philippines. But do you all know that for me to arrive in Cebu, it took many hours of hard work of our backend support colleagues at the MSF offices. On the day I reported in to the MSF Hong Kong office, the day before I set off, I could see frustrations, fatigue and some anger on the concerned faces of all the supporting colleagues in the back office team. They probably wished they could work even faster. Some of them were rushing to find, select and coordinate groups of aid workers across disciplines (we need not just doctors, but nurses, anesthetists, pharmacists, logisticians etc), while some were frantically collecting the latest updates and preparing news releases and reports to be sent out to various media channels. Also, there is the fundraising team, which is working round the clock to set up appeals and launch campaigns to raise money for this mission. And also provide updates to the public on funds raised and how these are being spent. Disregarding their weariness, everyone at the back office has put in extra time and effort to work on this relief mission and all of them hold that same desire to help the victims in Philippines. You may not be able to see the efforts put in by this special team of support staff but their contribution is without doubt important and necessary. They too deserve to be encouraged by everyone out there! Medecins Sans Frontieres (Doctors without Borders) has never operated only with the help of doctors, but with a concerted effort from everyone else in the background. I will definitely give my very best in this mission and hope all of you will do the same too!